48 Norwegian research institutes recieve basic funding from the government. SINTEF Energy Research is one of these institutes. The basic funding is used for competence building activities that open up the new research areas of the future. Here is an example of a project that is financed through basic funding: NanoHX. The project will end in 2015. The last couple of years, a team at SINTEF Energy Research has studied a concept for improving cooling systems through the use of magnetic nanofluids, also called ferrofluids. 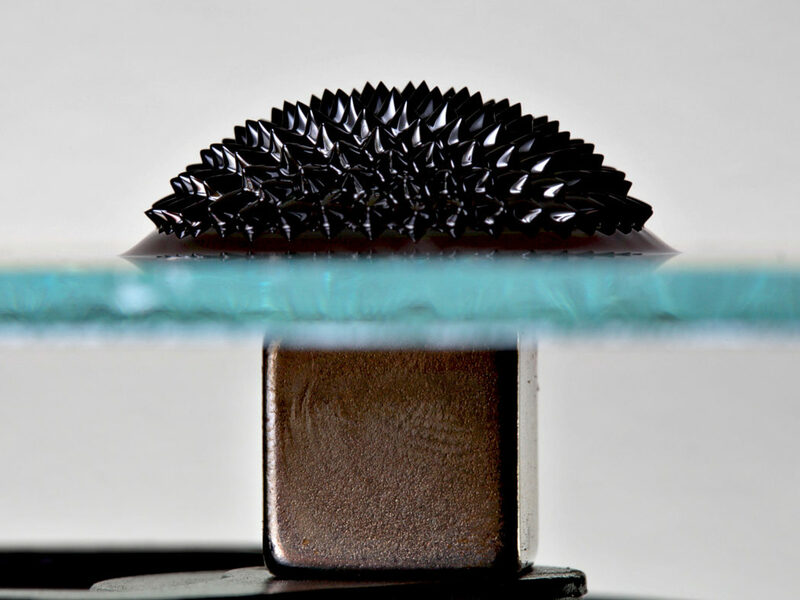 Ferrofluids are liquids where extremely small, magnetic particles are added. They have the potential to improve the robustness and decrease building and maintenance costs of for instance offshore wind mills and subsea factories. They are affected by magnetic fields. This may be used to create what is called a thermomagnetic pump. Ferrofluids have increased thermal conductivity. Find out more about the NanoHX-project here. In the NanoHX project, we have developed mathematical models and a simulation tool that can be used to estimate how ferrofluids perform relative to traditional fluids. The models and the simulation tool have been described in detail in a recently published paper, see here. We have used the simulation tool to estimate the heat transfer performance of a passive cooling system. That is, we simulate a flow loop that transports heat from a heat source to a heat sink. With an ordinary fluid, the flow is governed by natural convection, with no moving parts. If we add an electromagnet across the heat source and use a ferrofluid, we will get an improved heat transfer performance due to the increased conductivity, but also due to the thermomagnetic pump. Still with no moving parts. It is important to remark that the heat transfer improvement depends heavily on the shape and placement of the electromagnet and on the the size of the nanoparticles in the ferrofluid. We therefore developed some design rules in order to find the optimal shape of the electromagnet and an optimal particle size. The design rules are of course restricted by several factors, such as the fact that the electromagnet must fit across the heat source in the flow loop, and that the particle sizes need to be within common nanoparticle manufacturing limits. The results from the simulations are very promising: The cooling performance with ferrofluids may be as much as 4 times as large as the performance with traditional fluids and pure natural convection. Even with no electromagnet we observe improvements up to 50%, which is an improvement simply due to adding the nanoparticles. The cooling performance with ferrofluids may be as much as 4 times as large as the performance with traditional fluids and pure natural convection. The results here strengthen what is already found in the scientific literature: that nanofluids and ferrofluids may be used to achieve significant improvements to heat transfer performance. In the future, we want to continue the work by doing more simulations on similar and more realistic systems. We also want to do experiments to fill some knowledge gaps. These experiments will be very useful for verification of the mathematical models.